Earlier this month, a new study from GLAAD revealed that no movie released by either Disney nor Paramount last year featured a single gay or lesbian character. The organization called out Disney specifically for not featuring any homosexual characters in last year's biggest movie, Star Wars: The Force Awakens, while asking the studio to consider putting a gay character in the upcoming Star Wars: Episode VIII, which is currently in production. 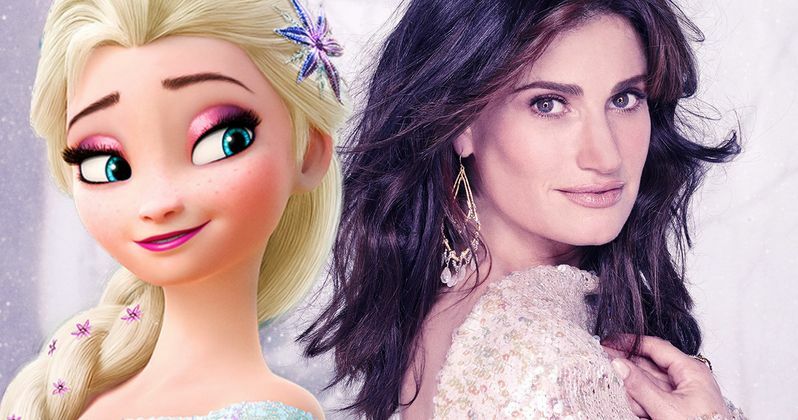 Shortly after the report was released, Disney fans started an online campaign of their own, petitioning the studio to give Elsa (Idina Menzel), from the studio's blockbuster Frozen, a girlfriend in the upcoming sequel Frozen 2. As it turns out, Idina Menzel herself is on board for this campaign. Earlier this month, the hashtag #GiveElsaAGirlfriend started trending worldwide, which gave new life to a Change.org online petition that surfaced last year. The petition currently has 2,101 signatures, just 399 short of its 2,500 goal. ET Online caught up with Idina Menzel on the red carpet of the Billboard Music Awards in Las Vegas over the weekend, where the actress revealed that she supports this online campaign. Here's what she had to say below. "I think it's great that she's stirring it up. Disney's just gotta contend with that. I'll let them figure that out. No matter what, (Elsa) changed my life." Idina Menzel's co-star Kristen Bell revealed in March that the script for Frozen 2 has been completed, and that she was set to begin recording her dialogue later that month. Very little is known about the story, but Frozen co-director Chris Buck, who returns to direct the sequel alongside Jennifer Lee, revealed in August that fans will get to see a different, happier side to Elsa's personality, which will carry over from last year's short film Frozen Fever. We don't know for sure if the sequel will address the fans' petition to give Elsa a girlfriend or not. Frozen took in over $400 million at the domestic box office in 2013, and more than $1.2 billion worldwide, becoming the highest-grossing animated film of all time. The Original Frozen movie voice actors Kristen Bell (Anna), Idina Menzel (Elsa), Jonathan Groff (Kristoff) and Josh Gad (Olaf) are expected to reprise their roles from Frozen and last year's Frozen Fever short film, but we don't know if any other Frozen characters will be back, or which new characters will be introduced. Disney still hasn't issued a release date for Frozen 2 quite yet. Related: Star Wars 9 and Frozen 2 Trailers to Arrive Before Christmas? The original Frozen followed Anna (Kristen Bell), who sets off on a journey to find her sister Elsa (Idina Menzel), whose frigid powers have brought an eternal winter to their homeland of Arendelle. The short film Frozen Fever, which was attached to theatrical prints of Cinderella last year, followed Elsa and Kristoff trying to throw a birthday party for Elsa, but when Elsa catches a cold, her powers put more than just the party at risk. Stay tuned for more on Frozen 2 and the campaign to give Elsa a girlfriend in this sequel.